Per the U.S. government's warning (at Thursday night) to all Internet users of disabling Java temporarily because of the potential hacking attacks, to protect your computer, you can choose either disable Java for all of your browsers, or delete/remove Java completely. For Windows user, remove Java is the same as you would remove any other software from the computer. Select Java by clicking on it, and then click the Uninstall button. 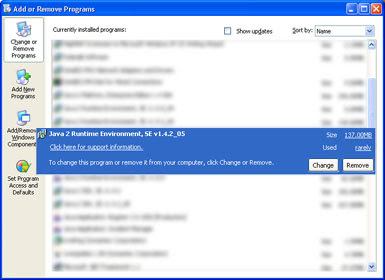 The Add/Remove control panel displays a list of software on your system, including any Java software products that are on your computer. Select Java that you want to uninstall by clicking on it, and then click the Remove button. Note: To uninstall Java 7, you must have Administrator privileges.